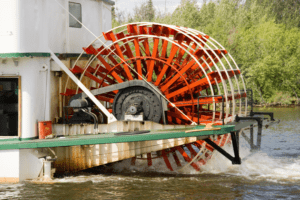 Riverboat Accident Lawyer | Simmons and Fletcher, P.C. Unfortunately, sometimes injuries occur while on a riverboat. Whether you are there as a passenger or as a crew member, you may have a legal right to recover for your harms and losses if you are injured while on a riverboat. Our riverboat accident attorneys are here to discuss your case if you have been injured on a riverboat. Cal 1-800-298-0111 for a free consultation today. Your contract with the riverboat may substantially affect, alter or limit your rights. Many riverboat tickets and/or contracts contain clauses limiting what State law governs personal injury claims and the time period in which you must file the claim. If you are injured on a riverboat you should take ALL paperwork including ticket stubs, contracts or any other documents you may have signed to a riverboat accident lawyers for review. You need to give notice to the riverboat of your injury immediately. Failure to notify the riverboat company could result in the loss of critical evidence or even worse, a waiver of your right to bring a claim. As you can see from above, delaying in seeking representation may result in your claim being more difficult to pursue. Talk to a riverboat accident lawyer as soon as possible. Because all rivers and lakes are considered to be under the control of Federal Law in the United States, riverboats are not subject to state worker’s compensation laws. Instead, you are likely to have a Jones Act claim for medical losses, lost income and housing expenses incurred due to your injuries. When the employer’s negligence is also at play, you may have a right to recover for your pain, suffering and disability. If there is a third-party such as a vendor or another vessel operator at fault, you may also have a third-party claim for your personal injuries. It is important that you retain a riverboat injury attorney who can help you determine what rights and remedies are available to you. Regardless of whether you were there for fun or for work, call Simmons and Fletcher, P.C. for a free consultation regarding your riverboat accident. Our firm has been helping injury victims since 1979 and we would love the opportunity to advise you. 1-800-298-0111.